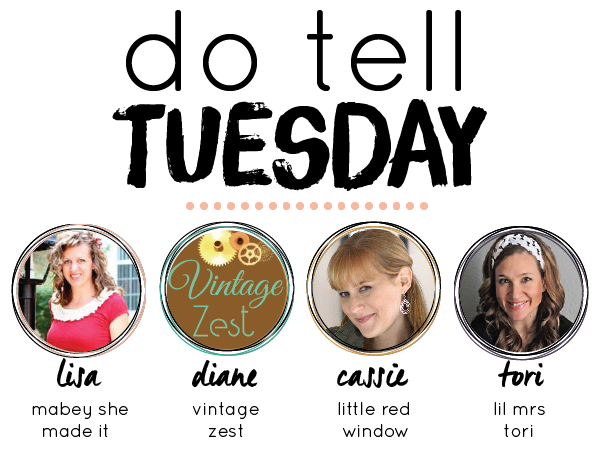 Welcome to Do Tell Tuesday! Do Tell Tuesday is the time where WE get to see what YOU are up to! Share your projects and recipes, then take time to look around at your fellow creatives. Not a blogger? That’s ok! You can still take a look around and discover some new ideas and inspiration! Each week a featured host will be bringing you a set of features. Before we get to this week, let’s meet the hosts! Hi Everyone! I loved ALL of the Fourth of July inspiration that was linked up at last week’s party! Here are a few of my favorites from that party! Now it’s time to link up your own projects for the chance to be featured next week! Thank you so much for featuring my tassel garland, Tori!! Thank you so much for choosing my No Sew Patriotic Bunting as one of your features this week! I’m way flattered!!! Thank you for featuring our Firecracker Table Display and our Ribbon and Lace Rustic Flag. Have a great day!